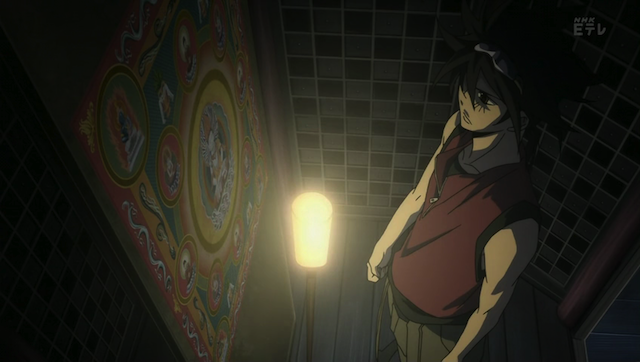 Φ Brain, AKA Phi Brain (occasionally referred to as Puzzle of God, or PoG) is a new series for the Fall 2011 anime season. It is a very shounen story about a boy who challenges some difficult (and dangerous) puzzles, and some of the sharpest puzzle solvers around. 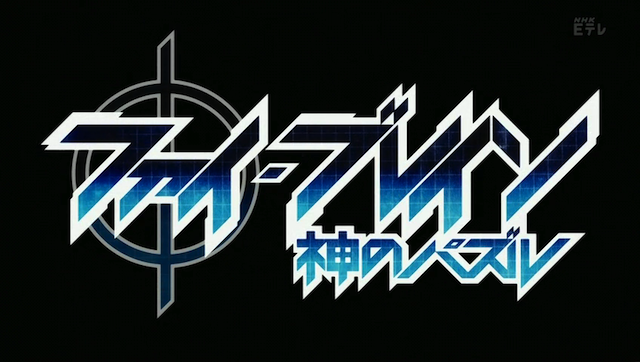 Although this first impression was written upon viewing only the first episode, I must say the show looks promising. Are you ready for some clever shounen action? 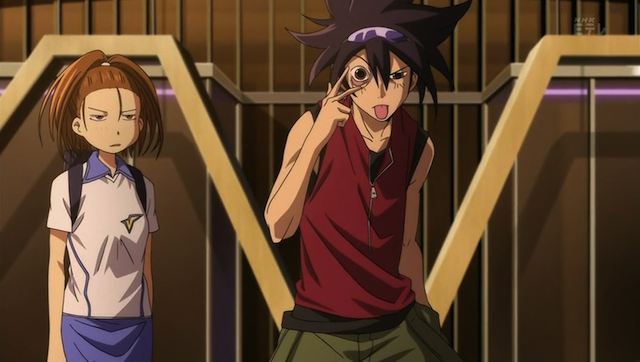 Phi Brain looks set to deliver. Your indecipherable smile is like a dangerous pazuru. This show has a sharp sense of visual style that comes across, both in the title cards and the graphic design of the games. Kaito saves the self-proclaimed Puzzle Master. The show begins with a puzzle fit for Indiana Jones. It is live, interactive, and very deadly. After the OP, we discover that Kaito has reason to believe that the maze also has no solution. 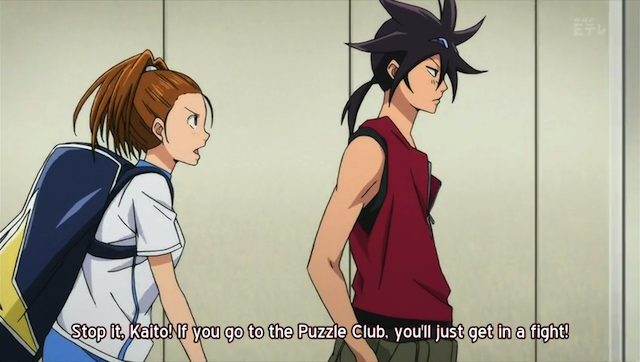 Fortunately for Kaito, some people are more understanding of his love for puzzles than Nonoha is. Jikugawa, the Student Council president and Baron Kaidou, the principal of the high school seem to be very interested in Kaito’s abilities. BTW, when your principal is voiced by Keiji Fujiwara you go to a pretty cool high school. Anyway, this one also has a crazy underground labyrinth behind it, and the Student Council president is also the president of the Puzzle Club. Girls just don't understand; sometimes a guy has gotta do, what a guy has gotta do. I really loved this scene in the hallway. There is something shounen-tastic about bravely marching into the Puzzle Club, even though you know it might end up in a fight. And just as Nonoha fears, some of the club members challenge Kaito … to solve their really hard sudoku. LOL. Another thing I like about it is that, although they don’t mention it in any way, Nonoha is obviously dressed for tennis club activities. That bag over her shoulder is a tennis gear bag. My point is that there isn’t one time this episode in which someone says, “Nonoha is very strong and athletic”. Instead we see her kicking Kaito around, equipped for a tennis match, and later racing away from Kaito at a speed he can’t match. By the end of this episode we have a very good idea of Nonoha as a person. 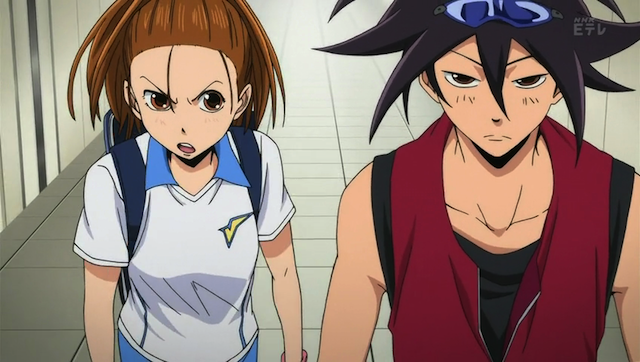 She is athletic, impulsive, and interested in Kaito. That might not sound like the most complex character you ever met, but it is the fact that this is all demonstrated, not explained that makes me think the show is going to handle its material well. Talking with Jikugawa about the mysterious Gameboy. As you can see in the shot above, the background art can be very nice. Jikugawa is an interesting character. As not only the president of the Puzzle Club, but also the president of the Student Council, he is one of the elites at the school, and seems to know quite a bit about the mysterious puzzle, known as the Sage Puzzle, that is set into the hill behind the school. He is the one who gave the mysterious Gameboy to Kaito which unlocked the Sage Puzzle. Nonoha looks on in disgust as Kaito demonstrates the "Einstein pose". A puzzle within the puzzle. Again, notice the strong sense of visual style. Despite the danger, Kaito and Nonoha attempt to solve the mysterious Sage Puzzle. The existence of such an elaborate puzzle (especially the secret existence) is hardly plausible, but fantastical premises are not out of place in shounen adventures. 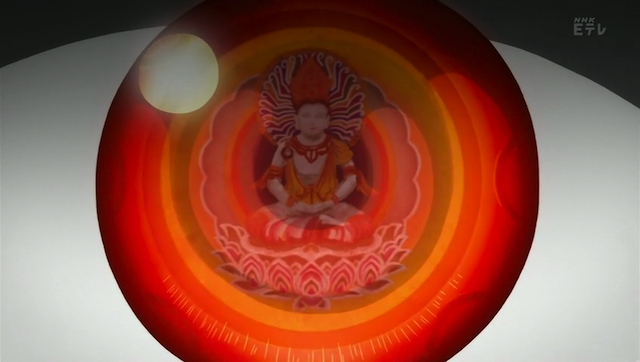 Another fantastical element is introduced late in the episode. There was also great background music in several parts of this episode. I really liked the lively piano & clapping music that begins as Kaito announces that “Puzzle time has begun”. Speaking of the audio direction more generally, it is very effective later in the same sequence. Nonoha takes the labyrinth lightly, and the music, along with everything else falls out from underneath her. The mandela sequence also had great background music. 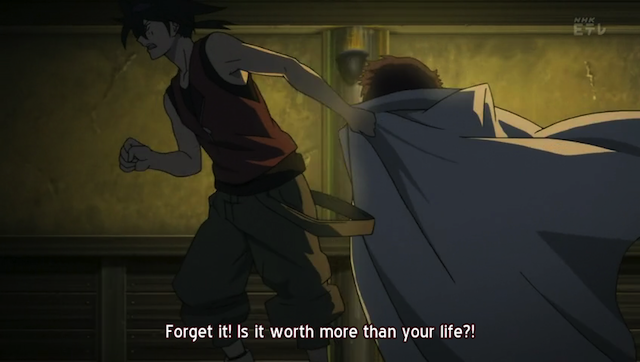 One major question remains: what about Kaito, what kind of person is he? So far Kaito doesn’t really break any molds as far as shounen heroes go. He is prideful, and seems to be manipulated by others using his pride to get him to do things on a couple of occasions. He isn’t the weak shounen hero (for comparison, see Aichi in Cardfight Vanguard) that starts off kind of whiney, and idolizes an older boy who he follows so he can “become stronger”. He seems to be more the sort that has incredible natural talent, and finds that talent repeatedly tested. Of course, Kaito’s strength isn’t physical. Unlike many shounen heroes he can’t fight impulsively, puzzles are solved by cool reflection, and Nonoha is used in this episode as a foil to demonstrate the danger and futility of acting without thinking. Obviously one episode is too soon to make a final decision about the quality of the show, but it looks quite promising, and I will continue watching to see what develops. I think it was too ambitious but having said that, it wasn’t all that terrible. In fact I’m pretty excited to meet that the new character in episode 2. He seems like fun! Ambitious? I’ll have to check your blog to see if you expand on that. I didn’t really see that, myself. 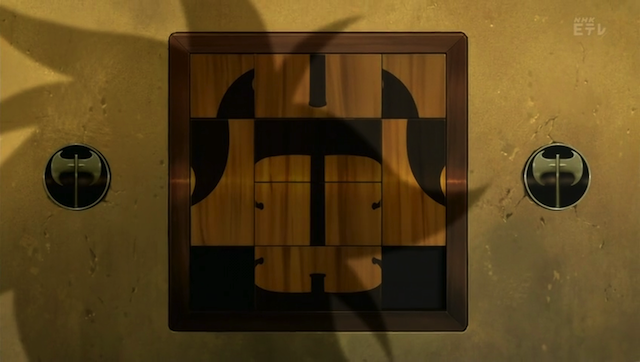 I wonder if you mean the scale of the Sage Puzzle was implausible; if so, I agree with you, but I’m willing to suspend disbelief to let the show tell an exciting story. I think the whole thing was pretty well assembled, so I’m hopeful they will deliver a fun ride. Wow, very interesting points you brought up here! I saw that the general reaction around the ‘sphere was one of disappointment in this episode’s lack of depth, but you are right about many things I haven’t noticed – I guess I sorta ignored the whole Nonoha being athletic part because I assumed that they already introduced her as being athletic earlier on, which they didn’t do at all. Thanks for saying that. 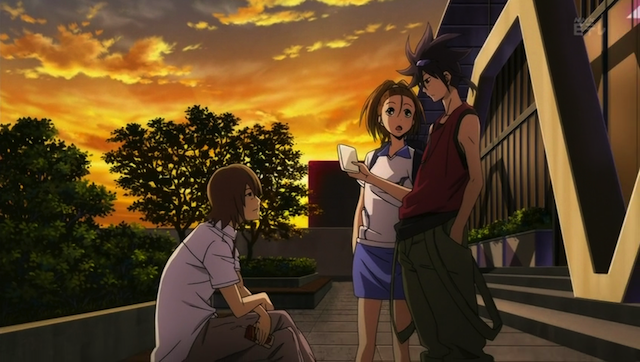 Phi Brain isn’t the deepest show I have ever seen, but this one is fun, and put together nicely. I particularly enjoy the music. I’m glad I’m watching it.